Fiat takes safety very seriously. 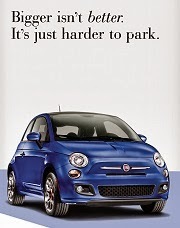 In the new Fiat 500, their goal was safety at all cost, with no impact on pricing. In this first part of a two part posting, we'll discuss the assumption that small cars can't be safe. 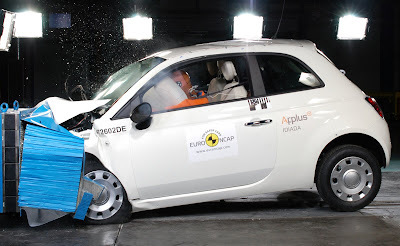 In the second posting, we'll discuss how the Fiat 500 achieved its high safety ratings. There's been a lot of misinformation in the media geared towards scaring people about small car safety. Rather than relying on media people with ulterior motives and questionable automotive knowledge, let's read what real experts have to say about small car safety. Just because a car is small doesn't mean it can't be safe. The thought and care given to its design and construction makes a difference. Euro NCAP, the organization that assesses the safety of new cars in Europe, has extensive experience safety testing cars of all sizes. They have concluded that it is not only larger or expensive cars that can achieve impressive results in safety. Recently, they released the results of six new cars and stated in a press release "Five out of the six cars received Euro NCAP’s maximum five star award. Euro NCAP is pleased to note that a number of less expensive cars were among these high performers. In these economically challenging times, consumers who wish to downsize their cars can still place safety at the top of their wish list". Michiel van Ratingen, Secretary General of Euro NCAP says "Many claim that the weight and size of a car is the only criteria for safety. We believe that there are other aspects of safety that are just as important. The smaller cars we tested...show that size should not stand in the way of all-round safety". 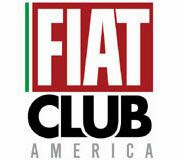 In their testing of the Fiat 500, NCAP released this statement "The iconic Fiat 500, Euro NCAP is pleased to announce, received five stars in adult occupant protection with an overall score of 35 points, revealing that Fiat has not compromised safety, even when compromising the car’s size." 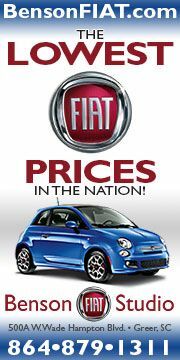 Designed to respect the highest standards, the Fiat 500 is one of the safest cars in its entire segment. The Fiat 500 can be fitted with up to 7 airbags as standard equipment (two at the front, two curtain-bags, two sidebags and one to protect the knees): a record for this vehicle class. 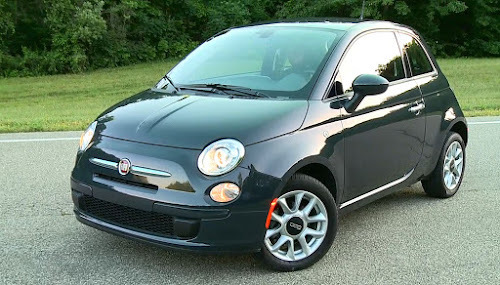 The Fiat 500 is 139.6 inches long and weighs 2050 lbs. and condition of crash dummy to the other vehicles shown below. "The passenger compartment remained stable during the impact. 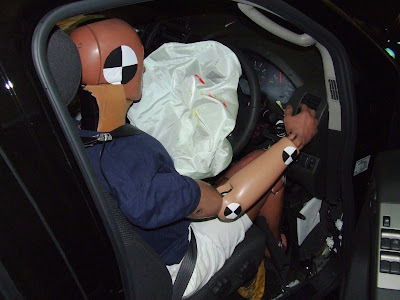 The driver's knees were well protected by an airbag. Fiat showed that the airbag would also protect larger and smaller occupants and those sat in different seating positions. There were no structures in the dashboard that presented a risk of injury to the passenger's knees and femurs". Assuming size is the most important factor determining the safety of a vehicle is a popular notion in the United States where the phrase "bigger is better" sums up all things automotive wise. Below we'll show a few examples of popular larger vehicles that have have poor crash tests. These are from large manufacturers who don't really have an excuse for the poor performances other than they put profit over safety. Before we look at the results a couple of points. First these are European versions that differ somewhat from US vehicles. Some are also right hand drive. The other point is that you can't accurately compare vehicles from different size classes and infer one will do better than the other in a real world crash. These examples are given to show that vehicle size doesn't guarantee a safer car. The first example is from Ford. It's the popular Ford Ranger pick up. A vehicle that, because it's 203.54 inches long and 4067 lbs, people assume is safe. Note how the A pillar (front windshield pillar) collapses. Indeed the whole passenger compartment is compromised. 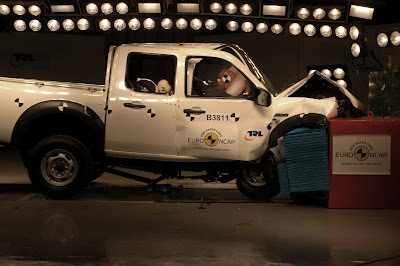 Notes from NCAP Front impact test on the Ford Ranger: "The Ranger did not achieve the minimum number of points in this test to get a three star rating, even though it scored enough points overall. The impact overloaded the structure and the passenger compartment became unstable. The car was penalized for that and for the following: collapse of the A-pillar and the extent of rearward movement of the steering wheel; the risk posed to the driver's lower legs by upward movement of the brake pedal; rupture of the footwell and rearward displacement of the pedals, which exceeded 400mm. There was insufficient pressure in the airbag to prevent the head from contacting the steering wheel." and how far the door is open. "Protection of the driver's chest was rated as weak, mainly due to the threat posed by the extent of structural collapse. 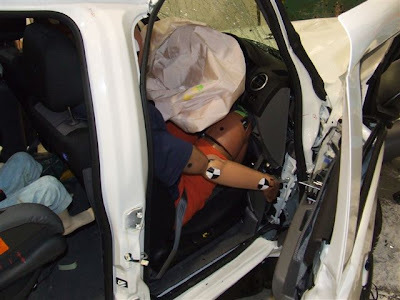 Values from the left knee of the driver dummy indicated a high risk of injury and protection was rated as poor. Deformation of the footwell and movement of the pedals resulted in poor protection of the driver's lower legs, feet and ankles." Nissan Frontier = .5 stars The next vehicle is the Nissan Frontier. Again, a popular vehicle that weighs 4488lbs and is 205.51 inches long. 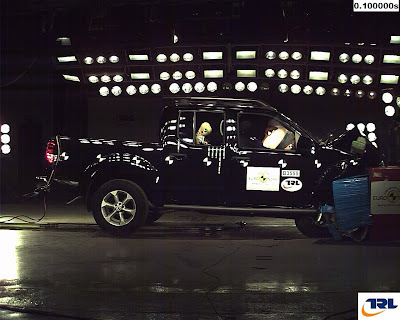 Notes from NCAP Front impact test on the Nissan Frontier (Navara in Europe): "The Navara achieved an extremely poor rating of a one star strike through ". The deformation of the door opening and how far the door is open. "The Navara's passenger compartment became unstable in the impact and would have been unable to withstand greater loading. The chassis rail collapsed on the impacted side, allowing a significant level of intrusion into the driver's footwell. As a result, the dummy readings indicated a high risk of injury to the left tibia". "In addition, the accelerator pedal moved rearwards more than 200mm, presenting a further risk of injury to the driver's lower legs. 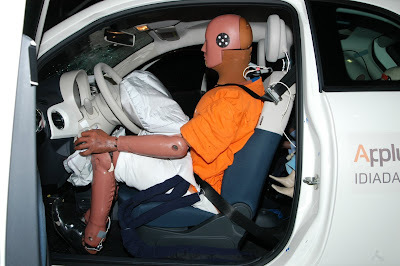 Structures in the dashboard presented a hazard to the knees and femurs of both the driver and the passenger. Protection of the driver's chest was rated as weak owing to the extent to which the chest was compressed, combined with the threat posed by the unstable passenger compartment. The passenger's neck was bent rearwards in the impact, presenting a high risk of life-threatening injury. The airbags and seatbelt pretensioners were triggered late in the impact and readings from the driver dummy's head also indicated a high risk of life threatening injury". "The Navara has been awarded a one star rating as its performance in frontal impact did not reach the minimum level required for a higher rating. Moreover, the unacceptably high risk of life threatening injury to the driver's head and the passenger's neck have led to that star being struck through". "Nissan have already introduced a counter-measure to overcome the delayed deployment of the frontal airbags. The change has already been introduced in production cars and Nissan will contact owners to advise them to get their cars upgraded at their dealers. 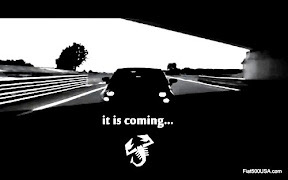 Euro NCAP will assess the modified car in the near future". A comparable car: Chevrolet Aveo = 1.5 stars Here's a more comparable car to the Fiat even though it is 30 inches longer at 169 inches and heavier by 546lbs or 2597 lbs. I'd like to make a comment about this car. This is a typical small car marketed in the United States by GM. It's not a terrible car, but it's a lack luster design and has inexcusable deficiencies in safety engineering from the largest carmaker in the world. When an American thinks of a small car, it's the kind of car that pops up in their mind. It's no wonder Americans traditionally have negative opinions on small cars. 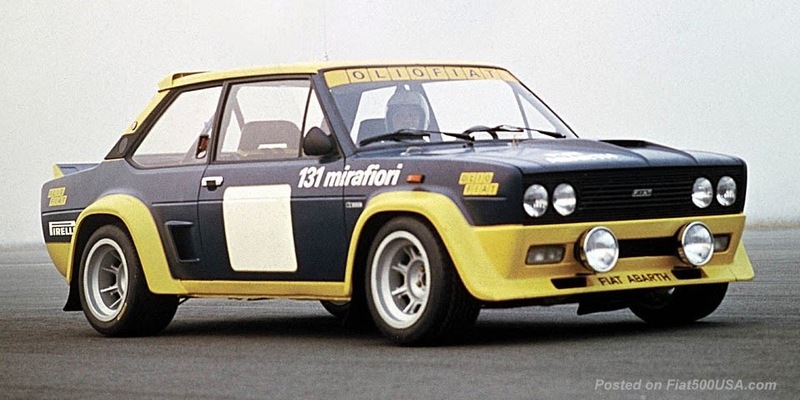 However, small cars like this are not in the same league as the Fiat. If you want to know why GM went bankrupt, look no further than cars like this. 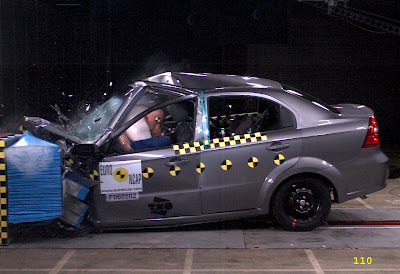 Notes from NCAP Front impact test on the Chevrolet Aveo: "Structural deformation and spot-weld release indicated that the bodyshell had been overloaded and had become unstable. Rearward movement of the A-pillar was penalized. Movement of the steering-wheel presented a hazard to the driver's head". "The driver's chest made contact with the steering-wheel, distorting the rim. Compression of the driver's chest indicated an unacceptably high risk of life-threatening injury. As a result, the final star of the adult occupant rating is struck through. 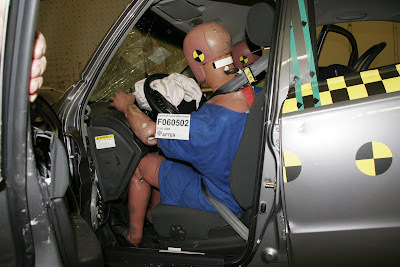 Structures in the dashboard represented a potential hazard to the knees and femurs of the driver and passenger. No points were awarded for the protection offered to the feet and ankles." As we see above, don't assume size is everything when it comes to safety engineering. For years many domestic manufacturers have relied on these simplistic automotive myths to sell their products and have neglected honest to goodness, real nut and bolt engineering to solve safety challenges. Now time has caught up with them. 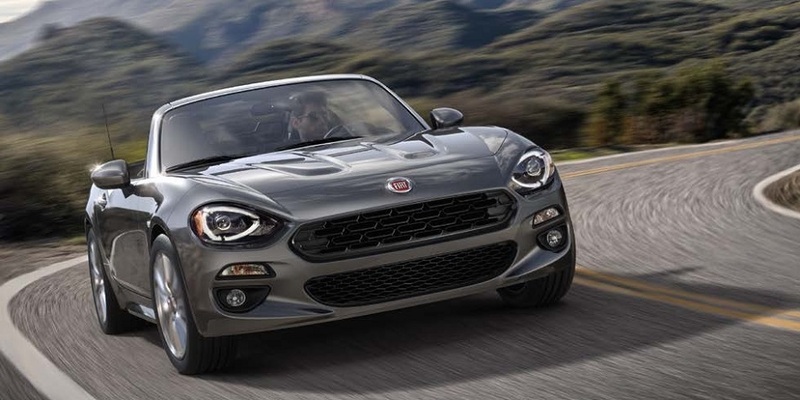 With the arrival of the Fiat 500, Americans are about to discover something Europeans have know for years, safety can come in small packages and when it does, it's usually inside a Fiat. Keep an eye out for the second part of this story where we'll talk about how the Fiat 500 achieved its high safety rating. Click here to go the the second part of this story.